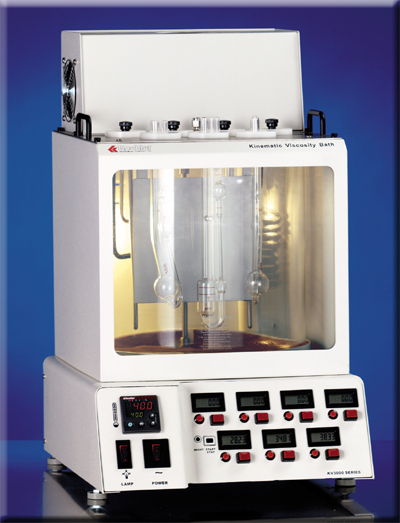 New constant temperature bath series with advanced temperature control circuitry and integrated timing features for convenient, accurate glass capillary viscometry determinations. Microprocessor PID circuitry assures precise, reliable temperature control within ASTM specified tolerances throughout the operating range of the bath. Simple push-button controls and dual digital displays permit easy setting and monitoring of bath temperature. Two place calibration offset capability is provided. Baths accommodate seven glass capillary viscometers of various types. Viewing the viscometers is made easy by glare-free fluorescent illumination inside the bath and a baffle that provides a background for easy viewing. Temperature control uniformity is assured by means of motorized stirrer which provides complete circulation without turbulence. Connection of the built-in cooling coil to tap water or a recirculating water chiller facilitates temperature control at ambient or below ambient temperatures. Communications software (RS232, etc.) ramp-to-set, and other enhanced features are available at additional cost. Contact your Koehler Customer Service representative for more information. 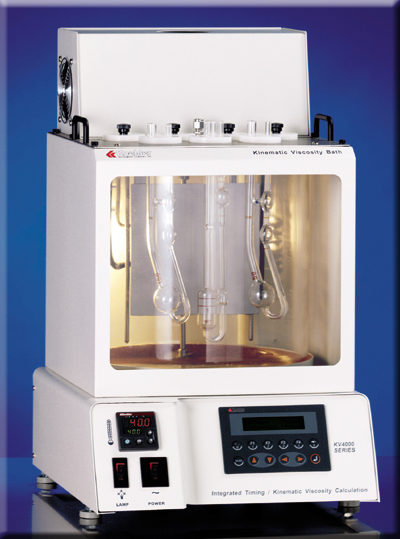 Integrated Timing Features — KV3000 incorporates seven digital timers on the front control panel for convenient timing and monitoring of the efflux interval for each viscometer. On KV4000, the user can enter the viscosity constant for each viscometer on the front LCD control/display, and then get the test result in both efflux time and viscosity units automatically after stopping each timer. All timing functions on both models are displayed in 0.1 second resolution and are accurate within 0.01%. Bath Construction and Safety Features — Bath chamber is a clear Pyrex vessel enclosed in a polyester-epoxy finished steel housing. Top working surface has seven 2" (51mm) viscometer ports and is constructed of stainless steel for easy cleaning. Front viewing window assures safe, distortion-free viewing. Microprocessor temperature controller incorporates safety circuitry that interrupts power to the heaters in the event of an overtemperature condition or disconnection of the primary probe. For added safety, a redundant adjustable controller with separate sensor probe interrupts power if an overtemperature situation occurs. An integrated low-liquid sensor prevents operation of the bath if the bath liquid is not filled to the proper level, and cuts off power should it fall below during operation. Both overtemperature and low liquid level circuits will latch and prevent further operation of the bath until the fault is removed. Bath rests on adjustable leveling feet. All electronics are mounted on a sliding tray for easy access. Includes thermometer holder and seven plastic port covers with handles. KV4000 — Seven start/stop buttons with integrated LCD display, retention of viscometer constant, automatic calculation and display in viscosity units or seconds to 0.1 seconds accurate to within 0.01%. Viscosity Software automatically calculates final test results from sample efflux times and includes a database for logging test data, determining test averages, standard deviations, and ASTM test repeatability. The database also manages information on the complete assortment of viscosity tubes available including type, constants, calibrations, and more. The sophisticated Windows®-based software package features an easy-to-navigate operation, a straightforward user interface, minimal draw on Windows® memory resources, an automatic real-time data acquisition via RS232 connection, and an additional timer / stopwatch feature for general laboratory use. The "test intelligent" software simplifies the process by assisting the operator in performing viscosity tests as per the required tests method. The test results are easily printed in accordance with ISO guidelines, and the final test results are exported with graphs and test analysis to Microsoft® Excel. The software package requires no PC hardware installation and includes the software installation CD and computer connection cable. For a complete demonstration of the Viscosity Software Package and its capabilities, please download a copy of the demo version (7.0MB file). After installing the demo software, you will be prompted to quickly register the demo with Koehler via email.